The Elizabeth Luke-Gabriel Zamorano Study Abroad Scholarship is a $5,000 award and was formed by the Luke family in memory of their beloved daughter, Elizabeth Ann Luke, who died in September of 2005 and in memory of a dear family friend, Gabriel Zamorano, who died in January of 2003. Both Elizabeth and Gabriel were graduates of the University of Pittsburgh. The Elizabeth Luke-Gabriel Zamorano Scholarship provides not only a study abroad experience but also an opportunity to celebrate the lives of two individuals who embodied the characteristics this scholarship promotes: enthusiasm for life, love of travel, and a passion for education. This scholarship provides a study abroad opportunity for one undergraduate business student at the University of Pittsburgh to study at Pompeu Fabra University in Barcelona, Spain for a spring semester and for one student from Pompeu Fabra University to study at the University of Pittsburgh. In life, Elizabeth Luke was known as a leader and teacher; whether it was excelling in academics or helping her family or students, Elizabeth always put forth a brilliant effort. Elizabeth attended the University of Pittsburgh where she graduated from the College of Arts and Sciences and the School of Law. Elizabeth taught social studies in Miami Lakes School District in Dade County, Florida. Elizabeth was extremely well traveled. She believed that it was only through travel she could allow her true personality to reveal itself. She scaled the Great Pyramids of Egypt, marveled at the Acropolis in Athens, swam the Sea of Galilee, climbed the majestic Matterhorn and walked the Way of the Cross in Jerusalem. She also spent time in Scandinavia, the Galapagos Islands, and the Arctic Circle. In life, Gabriel Zamorano was known as a peacemaker, father, husband and friend to all. He was born in Puerto Rico to a Puerto Rican mother and a father from Barcelona. His friendship with John Luke (Elizabeth's brother) was the start of a family friendship between the Lukes and Zamoranos. John and Gabriel became friends when Gabriel was sent to the United States to attend high school. 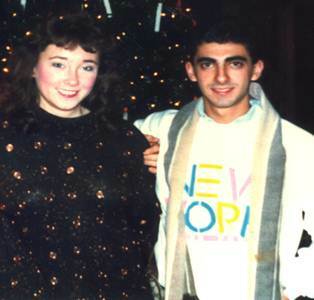 They met on a ski trip and because of John's interest in Spanish they became good friends. The Lukes encouraged Gabriel to attend the University of Pittsburgh. Gabriel attended the University of Pittsburgh and graduated from the College of General Studies. Eventually, Gabriel moved to Barcelona and married Ana López, a native of Spain, and they had twin daughters. During those years the Luke family visited the Zamorano family in Barcelona. The friendship between the families and losses they have shared have grown into a memorial scholarship for their son and daughter. The lives of Gabriel and Elizabeth are now honored by their families and the participants in this scholarship. As a participant you will meet and be befriended by the families. Please read these requirements carefully - You must meet these specific requirements in order to be eligible for the scholarship. Level 2 of Spanish must be satisfactorily completed. Completion of Spanish 3 and 4 preferred. Students interested in the scholarship should meet with Bryan Schultz, Director of International Programs at the College of Business Administration, to discuss the details. Materials submitted to any other office / location WILL NOT BE ACCEPTED. Shortly after the application deadline, the applications will be reviewed and finalists will be chosen by the Selection Committee to be interviewed. These students will be contacted to arrange an interview. Interviews will be conducted by the Selection Committee. An email indicating the Committee's decision will be sent to all applicants.